PLP acts as a coenzyme in all transamination reactions, and in certain decarboxylation, deamination, and racemization reactions of amino acids. The aldehyde group of PLP forms a Schiff-base linkage (internal aldimine) with the ε-amino group of a specific lysine group of the aminotransferase enzyme. The α-amino group of the amino acid substrate displaces the ε-amino group of the active-site lysine residue in a process known as transaldimination. The resulting external aldimine can lose a proton, carbon dioxide, or an amino acid sidechain to become a quinonoid intermediate, which in turn can act as a nucleophile in several reaction pathways. In transamination, after deprotonation the quinonoid intermediate accepts a proton at a different position to become a ketimine. The resulting ketimine is hydrolysed so that the amino group remains on the complex. In addition, PLP is used by aminotransferases (or transaminases) that act upon unusual sugars such as perosamine and desosamine. In these reactions, the PLP reacts with glutamate, which transfers its alpha-amino group to PLP to make pyridoxamine phosphate (PMP). PMP then transfers its nitrogen to the sugar, making an amino sugar. PLP is also involved in various beta-elimination reactions such as the reactions carried out by serine dehydratase and GDP-4-keto-6-deoxymannose-3-dehydratase (ColD). It is also active in the condensation reaction in heme synthesis. PLP is also found on glycogen phosphorylase in the liver, where it is used to break down glycogen in glycogenolysis when glucagon or epinephrine signals it to do so. However, this enzyme does not exploit the reactive aldehyde group, but instead utilizes the phosphate group on PLP to perform its reaction. Although the vast majority of PLP-dependent enzymes form an internal aldimine with PLP via an active site lysine residue, some PLP-dependent enzymes do not have this lysine residue, but instead have a histidine in the active site. In such a case, the histidine cannot form the internal aldimine, and, therefore, the co-factor does not become covalently tethered to the enzyme. GDP-4-keto-6-deoxymannose-3-dehydratase (ColD) is an example of such an enzyme. Mechanistic examples: racemization of alanine and elimination of cysteine. 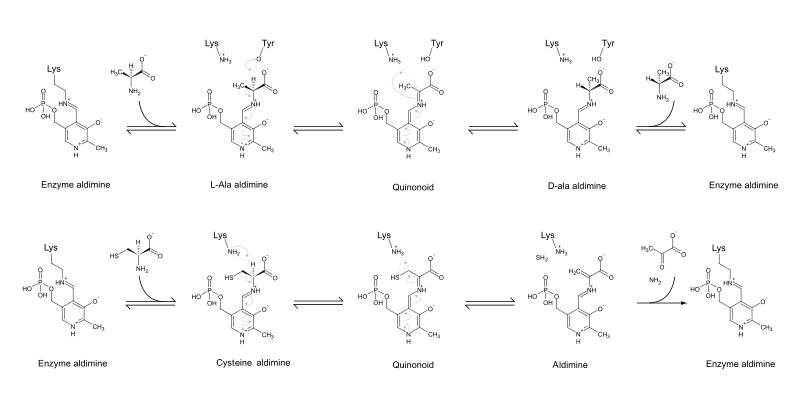 Specificity is conferred by the fact that, of the four bonds of the alpha-carbon of the amino acid aldimine state, the bond perpendicular to the pyridine ring will be broken (Dunathan Stereoelectronic Hypothesis). Consequently, specificity is dictated by how the enzymes bind their substrates. An additional role in specificity is played by the ease of protonation of the pyridine ring nitrogen. PLP is retained in the active site not only thanks to the lysine, but also thanks to the interaction of the phosphate group and a phosphate binding pocket and to a lesser extent thanks to base stacking of the pyridine ring with an overhanging aromatic residue, generally tyrosine (which may also partake in the acid–base catalysis). Despite the limited requirements for a PLP binding pocket, PLP enzymes belong to only five different families. These families do not correlate well with a particular type of reaction. The five families are classified as fold types followed by a Roman numeral. Animals are auxotroph for this enzyme co-factor and require it or an intermediate to be supplemented, hence its classification as a vitamin B6, unlike MoCo or CoQ10 for example. PLP is synthesized from pyridoxal by the enzyme pyridoxal kinase, requiring one ATP molecule. PLP is metabolized in the liver. Two natural pathways for PLP are currently known: one requires deoxyxylulose 5-phosphate (DXP), while the other does not, hence they are known as DXP-dependent and DXP-independent. These pathways have been studied extensively in Escherichia coli and Bacillus subtilis, respectively. Despite the disparity in the starting compounds and the different number of steps required, the two pathways possess many commonalities. The DXP-dependent biosynthetic route requires several steps and a convergence of two branches, one producing 3-hydroxy-1-aminoacetone phosphate from erythrose 4-phosphate, while the other (single enzyme) producing deoxyxylulose 5-phosphate (DXP) from glyceraldehyde 3-phosphate (GAP) and pyruvate. The condensation product of 3-hydroxy-1-aminoacetone phosphate and deoxyxylulose 5-phosphate is pyridoxine 5'-phosphate. The condensation is catalyzed by PNP synthase, encoded by pdxJ, which creates PNP (pyridoxine 5' phosphate). The final enzyme is PNP oxidase (pdxH), which catalyzes the oxidation of the 4' hydroxyl group to an aldehyde using dioxigen, resulting in hydrogen peroxide. The first branch is catalyzed in E. coli by enzymes encoded by epd, pdxB, serC and pdxA. These share mechanistical similarities and homology with the three enzymes in serine biosynthesis (serA (homologue of pdxB), serC, serB — however, epd is a homologue of gap), which points towards a shared evolutionary origin of the two pathways. In several species there are two homologues of the E. coli serC gene, generally one in a ser operon (serC), and the other in a pdx operon, in which case it is called pdxF. A "serendipitous pathway" was found in an overexpression library that could suppress the auxotrophy caused by the deletion of pdxB (encoding erythronate 4 phosphate dehydrogenase) in E. coli. The serendipitous pathway was very inefficient, but was possible due to the promiscuous activity of various enzymes. It started with 3-phosphohydroxypyruvate (the product of the serA-encoded enzyme in serine biosynthesis) and did not require erythronate-4-phosphate. 3PHP was dephosphorylated, resulting in an unstable intermediate that decarboxylates spontaneously (hence the presence of the phosphate in the serine biosynthetic pathway) to glycaldehyde. Glycaldehyde was condensed with glycine and the phosphorylated product was 4-phosphohydroxythreonine (4PHT), the canonical substate for 4-PHT dehydrogenase (pdxA). The DXP-independent PLP-biosynthetic route consists of a step catalyzed by PLP-synthase, an enzyme composed of two subunits. PdxS catalyzes the condensation of ribulose 5-phosphate, glyceraldehyde-3-phosphate, and ammonia, this latter molecules is produced by PdxT which catalyzes the production of ammonia from glutamine. PdxS is a (β/α)8 barrel (also known as a TIM-barrel) that forms a dodecamer. The widespread utilization of PLP in central metabolism, especially in amino acid biosynthesis, and its activity in the absence of enzymes, suggests PLP may be a prebiotic compound. In fact, heating NH3 and glycoaldehyde spontaneously forms a variety of pyridines, including pyridoxal. Under certain conditions, PLP is formed from cyanoacetylene, diacetylene, carbon monoxide, hydrogen, water, and a phosphoric acid. Several inhibitors of PLP enzymes are known. One type of inhibitor forms an electrophile with PLP, causing it to irreversibly react with the active site lysine. Acetylenic compounds (e.g. propargylglycine) and vinylic compounds (e.g. vinylglycine) are such inhibitors. A different type of inhibitor inactivates PLP, and such are α-methyl and amino-oxy substrate analogs (e.g. α-methylglutamate). Still other inhibitors have good leaving groups that nucleophilically attack the PLP. Such is chloroalanine, which inhibits a large number of enzymes. AlaP (alanine phosphonate) inihibits alanine racemases, but its lack of specificity has prompted further designs of ALR inhibitors. ^ Kozlov E.I., L. M. S. Stability of water-soluble vitamins and coenzymes. Hydrolysis of pyridoxal-5-phosphate in acidic, neutral, and weakly alkaline solutions. Pharmaceutical Chemistry Journal 1978, 11, 1543. ^ Percudani R1, Peracchi A. (2003). "Genomic overview of pyridoxal-phosphate-dependent enzymes". EMBO Rep. 4 (9): 850–4. doi:10.1038/sj.embor.embor914. PMC 1326353. PMID 12949584. ^ David Dolphin, R Poulson, and O Avramovic. Vitamin B6: Pyridoxal Phosphate Volume 1, Part B, Coenzymes and Cofactors. Wiley Interscience, New YorkYear: 1986 ISBN 978-0471097853. Preface. ^ Toney, M. D. "Reaction specificity in pyridoxal enzymes." Archives of biochemistry and biophysics (2005) 433: 279-287. ^ a b Samuel, G. and Reeves, P. "Biosynthesis of O-antigens: genes and pathways involved in nucleotide sugar precusor synthesis and O-antigen assembly." Carbohydrate research (2003) 338:2503-2519. ^ Cook P. D., Thoden J.B. and Holden H. M. "The structure of GDP-4-keto-6-deoxymannose-3-dehydratase: a unique coenzyme B6-dependent enzyme." Protein Science (2006) 15:2093-2106. ^ a b c Eliot, A. C.; Kirsch, J. F. (2004). "PYRIDOXALPHOSPHATEENZYMES: Mechanistic, Structural, and Evolutionary Considerations". Annual Review of Biochemistry. 73: 383–415. doi:10.1146/annurev.biochem.73.011303.074021. PMID 15189147. ^ Griswold, W. R.; Toney, M. D. (2011). "Role of the Pyridine Nitrogen in Pyridoxal 5′-Phosphate Catalysis: Activity of Three Classes of PLP Enzymes Reconstituted with Deazapyridoxal 5′-Phosphate". Journal of the American Chemical Society. 133 (37): 14823–14830. doi:10.1021/ja2061006. PMID 21827189. ^ Fitzpatrick, T. B.; Amrhein, N.; Kappes, B.; Macheroux, P.; Tews, I.; Raschle, T. (2007). "Two independent routes of de novo vitamin B6 biosynthesis: Not that different after all". Biochemical Journal. 407 (1): 1–13. doi:10.1042/BJ20070765. PMID 17822383. ^ Sakai, A.; Kita, M.; Tani, Y. (2004). "Recent progress of vitamin B6 biosynthesis". Journal of Nutritional Science and Vitaminology. 50 (2): 69–77. doi:10.3177/jnsv.50.69. PMID 15242009. ^ Lam, H. M.; Winkler, M. E. (1990). "Metabolic relationships between pyridoxine (vitamin B6) and serine biosynthesis in Escherichia coli K-12". Journal of Bacteriology. 172 (11): 6518–6528. PMC 526841. PMID 2121717. ^ Kim, J.; Kershner, J. P.; Novikov, Y.; Shoemaker, R. K.; Copley, S. D. (2010). "Three serendipitous pathways in E. Coli can bypass a block in pyridoxal-5′-phosphate synthesis". Molecular Systems Biology. 6: 436. doi:10.1038/msb.2010.88. PMC 3010111. PMID 21119630. ^ Zhu, J.; Burgner, J. W.; Harms, E.; Belitsky, B. R.; Smith, J. L. (2005). "A New Arrangement of (α/β)8 Barrels in the Synthase Subunit of PLP Synthase". Journal of Biological Chemistry. 280 (30): 27914–27923. doi:10.1074/jbc.M503642200. PMID 15911615. ^ a b Austin, S. M.; Waddell, T. G. (1999). "Prebiotic synthesis of vitamin B6-type compounds". Origins of Life and Evolution of the Biosphere : The Journal of the International Society for the Study of the Origin of Life. 29 (3): 287–296. PMID 10389266. ^ Aylward, N.; Bofinger, N. (2006). "A plausible prebiotic synthesis of pyridoxal phosphate: Vitamin B6 – A computational study". Biophysical Chemistry. 123 (2–3): 113–121. doi:10.1016/j.bpc.2006.04.014. PMID 16730878. ^ Anthony, K. G.; Strych, U.; Yeung, K. R.; Shoen, C. S.; Perez, O.; Krause, K. L.; Cynamon, M. H.; Aristoff, P. A.; Koski, R. A. (2011). Ahmed, Niyaz (ed.). "New Classes of Alanine Racemase Inhibitors Identified by High-Throughput Screening Show Antimicrobial Activity against Mycobacterium tuberculosis". PLoS ONE. 6 (5): e20374. doi:10.1371/journal.pone.0020374. PMC 3102704. PMID 21637807.